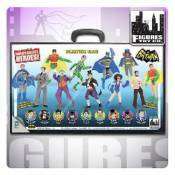 Batman Retro Action Figures Carry Case: Don't let your Batman Retro Action Figures get all messed up from just lying about! This awesome Batman Retro Action Figures Carry Case is the perfect thing for you to store your Batman Retro Action Figures in. Not only does it have space inside of it to fit all of your Batman Retro Action Figures, but it's also got a cool image of all of them on it so you know which figures that you have left to collect. Measures about 22-inches long x 13-inches wide with 12 individual vertical slots for un-packaged figures, and two long horizontal slots for accessories.